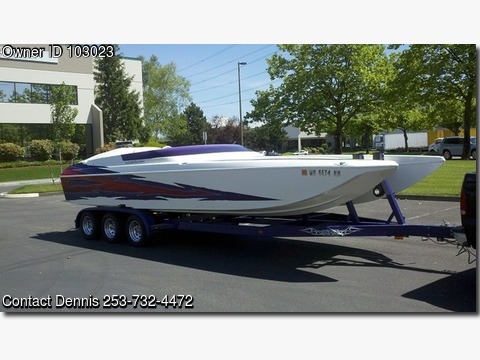 Please call owner Dennis at 253-732-4472 Boat Location: Tacoma, Washington. 2003 Eliminator Daytona 25ft. Newer AM/FM, anchor, 3 bilge pumps, Coast Guard pack, carpet, custom cockpit cover, full gauges, hydraulic steering, GPS, mooring cover, storage, dual batteries, Blown all Aluminum 540, 900Hp, Imco Outdrive with 2 Inch Shorty 150 Gears. 32p Custom Prop, 8-71 blower with intercooler, CMI Headers, Pre Oil System, Oil Cooler, Sea Strainer, Aeromative Fuel Pump, 2-1050 Holly's Boost Referenced. Cower Crank, Manley H Rods, Weisco Custom Pistons, Canfield Ported Heads with Faraia SS Valves. 20 Inch Dana Trim Tabs.